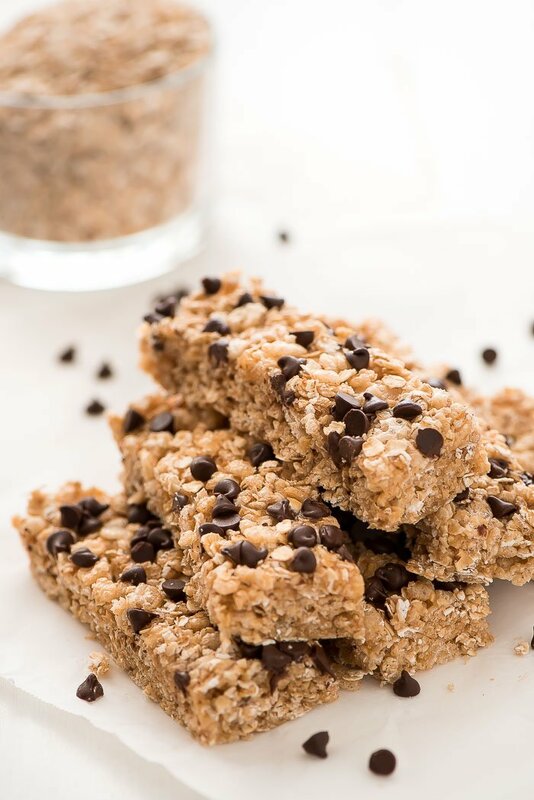 It takes just six ingredients and 10 minutes to make these No Bake Chocolate Chip Granola Bars that are the perfect afternoon snack for kids and adults. PIN IT to your Snack board to save it and share it! I am a snacker. I could munch on granola all day long. 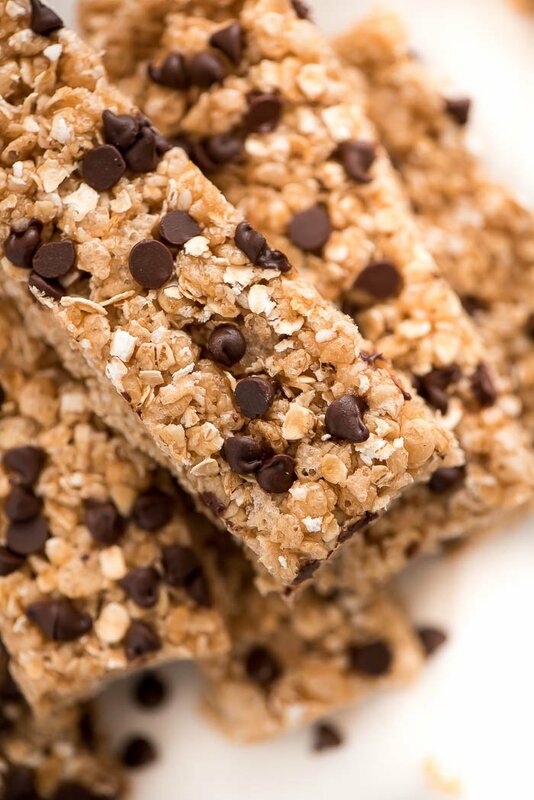 As a kid I loved those chewy Quaker granola bars and I actually still do. My two year old appears to have taken after me and loves them just as much. Rather than spend three bucks on a box of six, I decided make my own for a fraction of the price. 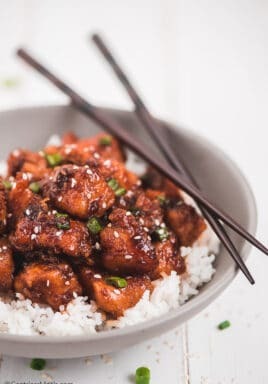 Not only do they taste delicious but they are super easy to make. 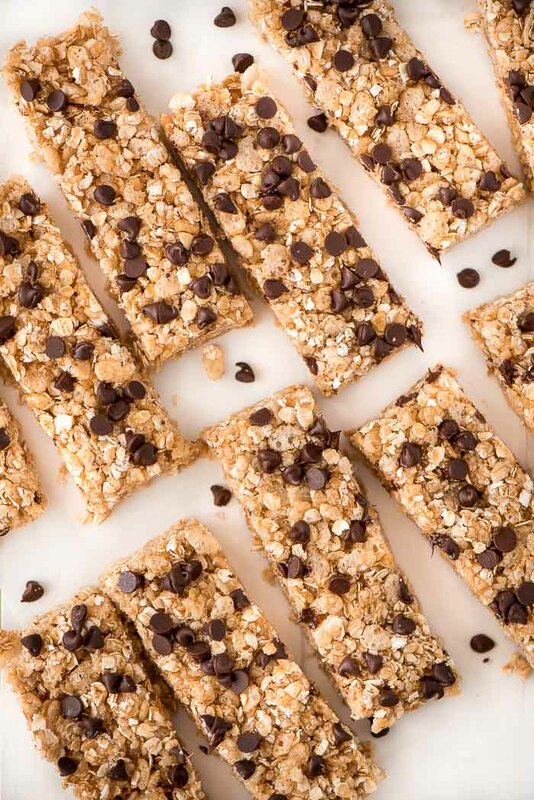 To make these granola bars, all you have to do is mix together rice cereal and quick oats and then make the “glue” or syrup. The syrup is only 3 simple ingredients- honey, brown sugar, and butter. 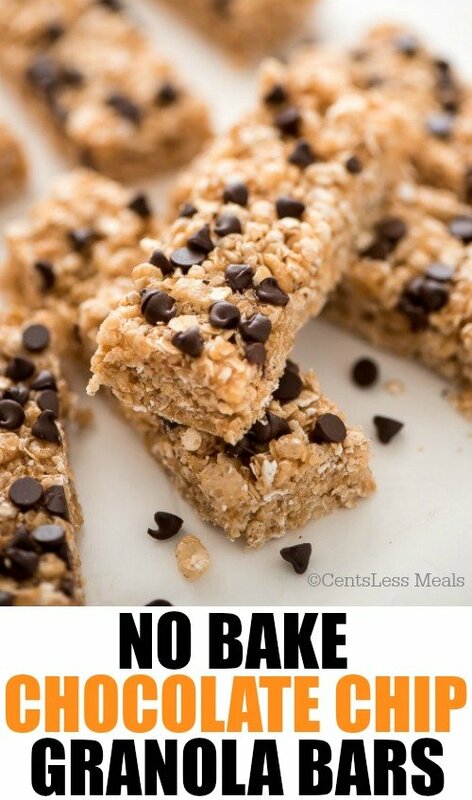 Bring them to a boil, cook for 2 minutes and then just mix it with the cereal, press in a pan, and sprinkle with chocolate chips. Super easy. I bet a third grader could do it. So yeah, no excuses! If your kids are too little to trust them near a stove, you can still involve them in measuring things out and mixing the cereal and oats. My little girls’ favorite part is helping me press the chocolate chips in. I’m sure you can guess why. They’re little chocolate monsters! I’m pretty sure they used twice the amount of chocolate that this recipe calls for. What can I say? They get their chocolate addiction from me! 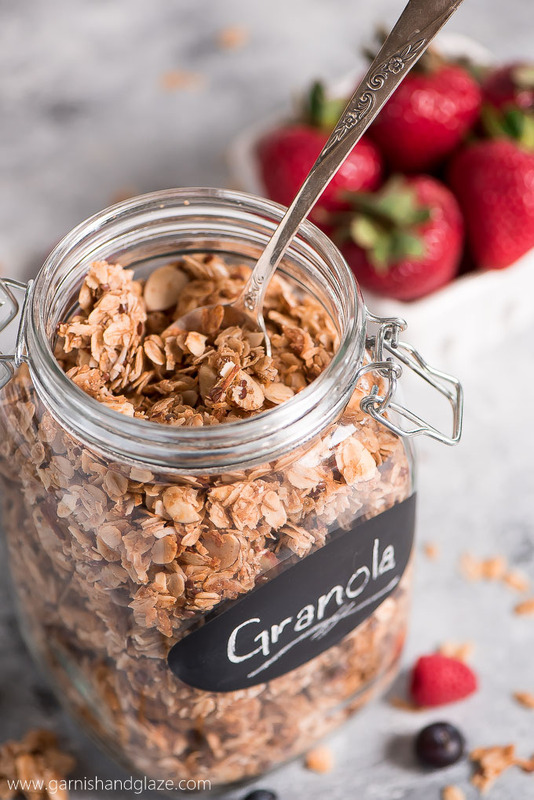 Once the granola has cooled, cut it up into bars, and wrap individually in foil for a grab-and-go snack. 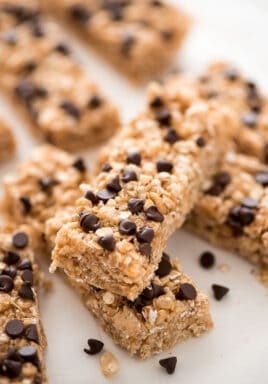 They’re only 130 calories and have just enough chocolate and sugar to curb your desire for a dessert. 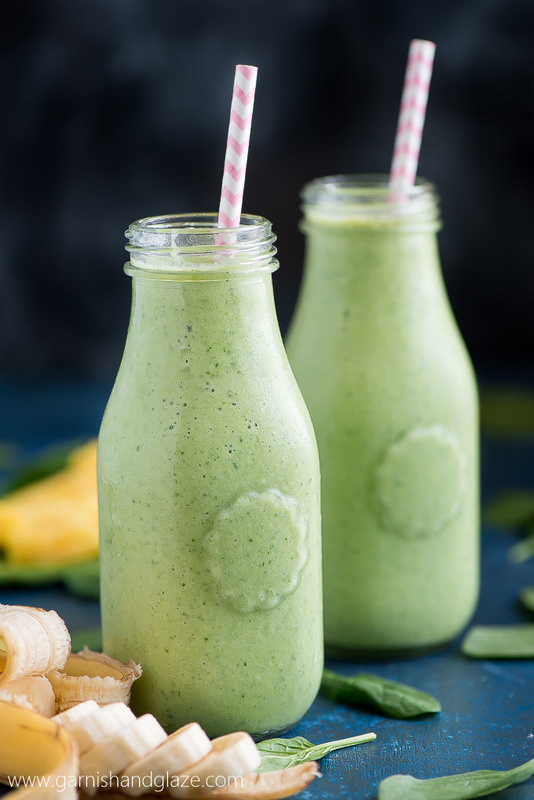 Prepare for the school year starting up by making a batch or two of these to throw into your kids’ lunch or have ready for them to munch on when they get off the bus. Enjoy! Mix oats and cereal together in a bowl and set aside. 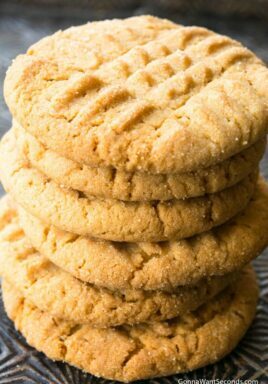 In a small sauce pan, bring brown sugar, honey, and butter to a boil over medium heat. Lower to medium-low and gently boil for 2 minutes. Remove from heat and pour over the cereal/oats. 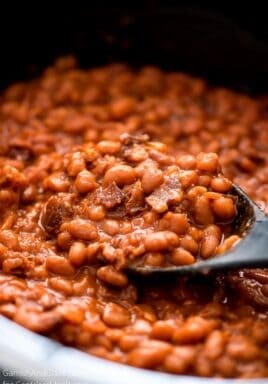 Mix until evenly coated and press into an 8x8 inch square pan. 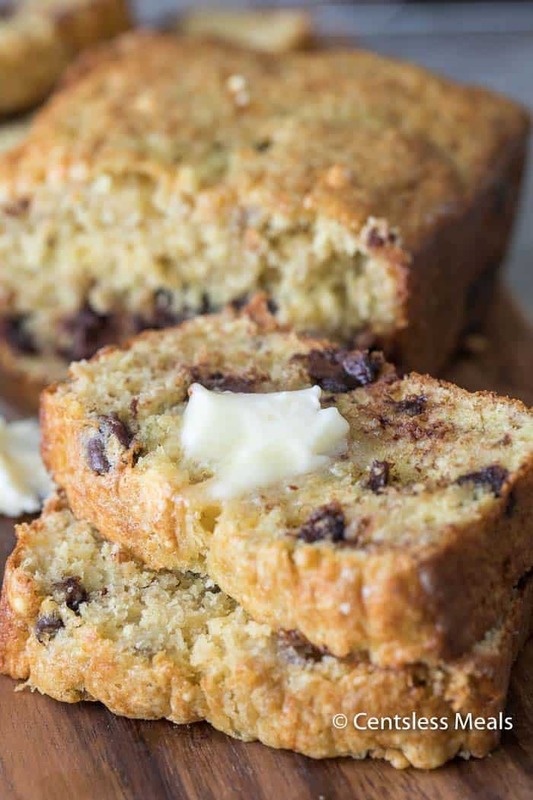 Immediately sprinkle with the chocolate chips and press them down. Let bars cool all the way before cutting. Wrap individually in plastic wrap.